With Cinco de Mayo coming up, I've been seeing recipes for this traditional Mexican cake popping up on Pinterest and various food blogs. Based on the original recipe by Diana Kennedy in her book The Cuisines of Mexico (1972), this almond sponge cake recipe is quite simple to make. Torta de cielo literally translates to 'heavenly cake' and I do find the flavor of almonds heavenly. I knew I wanted to try making this but I saw a number of recipe variations. In the end, I chose to make the version posted by Meagan of Scarletta Bakes but with a couple of tweaks. The result was a rather dense cake loaded with almond flavor and a bit of crunch from the ground almonds. Once cooled, a few seconds in the microwave softens the cake and livens the fragrant almond taste. While Meagan's recipe did not call for separating eggs and beating the whites, some of the other recipes I found did. I suspect that step would make this cake less dense and I might opt for that next time. Nevertheless, the cake is a nice treat with a pot of afternoon tea or a big mug of morning coffee. And, Brian did not agree with me about trying to make the cake lighter next time. He thought it was perfect as it was...as evidenced by the fact that there's now a large pile of crumbs on the stand that housed the cake just two days ago! :) Enjoy! Line a 9" cake round or spring-form pan with parchment paper and spray with cooking spray. Place the almonds in a food processor and pulse until the nuts are the consistency of coarse meal. Using a stand mixer or hand mixer, cream together the butter and sugar until light and fluffy. Beat in the eggs, extracts. Add the salt, baking powder and flour until just incorporated. Fold in the almond meal and pour the batter into the cake pan. Bake in a pre-heated 350 degree oven for approximately 40 minutes (begin checking at 30 minutes) until a cake tester inserted in the center of the cake comes out clean. Remove from the oven and allow to cool before unmolding from the cake pan. Dust with confectioners' sugar. Makes approximately 8 servings. Mmmmmm, this reminds me of my childhood and is a TOTAL family favorite! Divine! I love the recipe. I would opt to separate and beat whites separately too, I do that when I make my homemade pancakes. It makes them very light and fluffy..I'm going to try this recipe and will bookmark it...Thanks for sharing! I would so love a slice of this with the coffee I am sipping right now- sounds perfect! I love almonds and use them a lot. This recipe looks like something I could easily decrease the carbs in without changing it too much. Great Cinco de May inspiration! Love the crumb on this cake, Anita! It will be perfect for a family get-together this weekend. Thanks for sharing! Yum, this cake looks so good. I love almonds, so I know I would love this cake. Perfect for cinco de mayo. Nut cakes and cakes with fruit as a rule are fairly dense unless nut flours are used or a small amount of nuts are used. Knowing this to be the standard, I accept them as dense and find nut cakes quite tasty! This one does look like something I would enjoy, almond is my fav next to pecans. that cake looks great! i'd love to have some with a cup of coffee! The cake sounds just delightful! Thanks for the tips, that sounds like a good idea to separate the eggs to make it lighter. Yum. I love almond... this cake sounds wonderful. I sometimes like a really dense cake I am not sure why lol. But I totally do the same thing and research other recipes to see whats different to figure out what to change to make it more what I want. 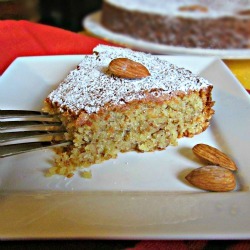 I just made an almond cake, and now I want to try out your version! Almonds are by far my favorite nut, I will put them in almost anything! This almond cake looks so crumbly! It must taste great! This cake looks delicious, Anita! Perfect with some coffee after dinner! I love the texture that almonds add to a cake. This looks perfect with a cuppa in the morning. I have made this often from the lost since the last move Sundays at Moosewood. That recipe separates the eggs. I have never not followed that recipe because (1)The people I make it for like a sponge cake, not a dense cake. (They say it has less calories.) and (2)It is beautiful to make it that way. The yolks and sugar become the most delicate tulip yellow color which then gets folded into the snowy, snowy stiffed egg whites. Certainly the taste is splendid (I use amaretto not brandy in the cake and may moisten it with a drop if so inclined) but it is a spectacular sensory experience to make it. separating the eggs will not decrease the caloric content of the cake. you're still putting in the same amount of the ingredient, just in two different steps of the recipe. sorry how much grams of butter ? This would translate to 184 grams of butter. Hey Everyone, Show Us Your Freezers!